Villa CA' TOGA is the residence/studio/retreat of Carlo Marchiori, an artist born in Rossano near Venice in 1937. Internationally known for his period-style murals in various hotels and casinos. He has created an enchanting villa that sings the tune of Palladio, Veronese and Venetian Culture. On five empty acres, bought in 1987, Marchiori began the recreation of the Italy he left behind as he immigrated to the New World in 1956. On the ground of the villa, Commedia dell’ Arte figures, Pulcinella, Pantalone and Arlecchino, adorn columns and gates in the sculpture courtyard. The Grotto and Roman Theater welcome visitors in the front yard. Toward the rear of the property are Greco-Roman ruins, shady river walk, Thai stupas and a pocket pyramid as well as Roman pool, fountains and hot tub. In the interior, the villa consists of a main Salone and six large rooms: Pompeiian Room, Library, Greek Room, Birdcage Room, Cow Room and Southwest Room. Each one is a surprise with whimsical theme or classical interpretation of ancient dream. Some murals were painted on large strips of canvas then installed onto the walls. Some rooms got painted directly on the walls (to save canvas) with ladders, scaffoldings and much sore neck! As to the name Villa—like the trompe l’oeil spaces inside, it may or may not be what it seems. But this is a creation of whimsy and visual delight of Marchiori. Visitors will find themselves in a different world where a sensitive artist has orchestrated art with harmony and nature. Villa Ca' Toga is based on Palladian architecture prototype. The present structure is built from scratch with materials like plywood and metal sheathing, false beams and plain 2x4s made to look like ancient columns or limestone pillars. A Palladian trademark is the appearance that the villa is set on a podium, focusing on the central part of the structure in relation to the flanking elements. Overall symmetry, arcade wings, arched and square windows are also Palladian trademark. 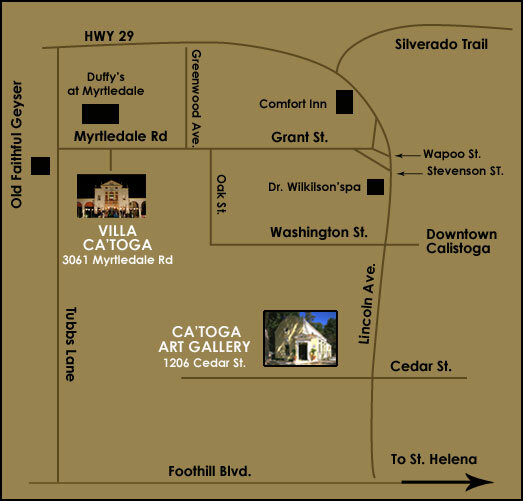 Villa Ca' Toga is also available for a small private events. Cost Upon Request. No weddings please. *Info and prices on this page are subject to change anytime.